Newcomers to the villages of Ivinghoe and Pitstone may not be aware of this gem standing out between Pitstone’s Vicarage Road and the new Castlemead development. 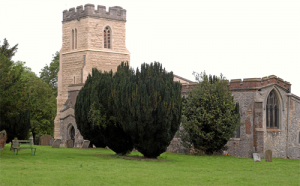 When the two parochial parishes were combined in 1974 its historical significance was appreciated and its future secured by being vested in the Churches Conservation Trust, with a local committee to look after the day to day administration. The earliest parts of the church, the chancel and north chapel, date back to 1250 and some carved fragments of stone from the 12th century indicate that it may have been built on the site of an earlier church. You should particularly look out for the Norman font, the unique brass (probably depicting Lady Neyrnut) and the ancient wooden chest and sanctuary chair. Notice the Medieval floor tiles and the wall painting, dating from the early seventeenth century. Limited car parking in Church Road, Pitstone.